Waters of lakes, seas and oceans of the northern hemisphere rotate counterclockwise, and the waters of the southern hemisphere rotate clockwise, forming giant whirlpools. The main reason for the rotation of the whirlpools are, local winds, flowing into the seas and oceans of the river and the deflecting force of Coriolis. And the higher the speed of winds, the higher the rotation speed of the whirlpools, and as a consequence, the higher the centrifugal force of the whirlpools, thereby raising the level of the waters of the seas and oceans. And the lower the rotation speed of the whirlpools, the lower the water level of the seas and oceans .. The speed of the currents along the perimeter of the seas and oceans is not the same everywhere and depends on the depth of the coast. In the shallow part of the seas and oceans, the current moves rapidly, and in the deep-water part of the seas and oceans the current moves slowly. Seasonal water level rise is not observed throughout the coast of the seas and oceans, but only in those coasts where the high angular velocity of the currents and as a consequence, the high centrifugal force of the water. (Centrifugal force F = mv2 / r). On the rectilinear coasts, where the currents do not have angular velocity, the water level does not increase. The waters of the Gulf of Finland rotate counter-clockwise, forming a whirlpool in the form of an ellipse. And when the seasonal south-west winds untwist the whirlpool to 5 km / h, the centrifugal force of the whirlpool increases, so that the water level rises to 30 cm on the eastern coast of the Gulf of Finland. A similar scheme of seasonal water level rise is observed in all lakes, seas and oceans .. The average depth of the Gulf of Finland is about 50 meters, on the east coast about 5 meters, in the west of the bay about 100 meters, for this reason, on the eastern coast of the Gulf of Finland, the linear and angular velocity of the currents is much higher (by how much less the depth of the coast, ) .. In the Gulf of Finland, seasonal water level rise has two peaks: in August-September, and in December-January and coincide with the season of south-west winds. The current velocity in the Gulf of Finland reaches from 2 to 17 km / h, and the maximum current speed on the Earth reaches 30 km / h, the wind speed is more than 100 km / h.
The waters of the North Sea rotate counter-clockwise forming a huge whirlpool. And when seasonal northwesterly storm winds unleash a whirlpool (up to 20 km / h on the southern coast), the centrifugal force of the whirlpool increases, so that on the southern coast of the North Sea the water level rises to 5 meters. (Storm wave 2.5 meters, centrifugal wave 2.5 meters). 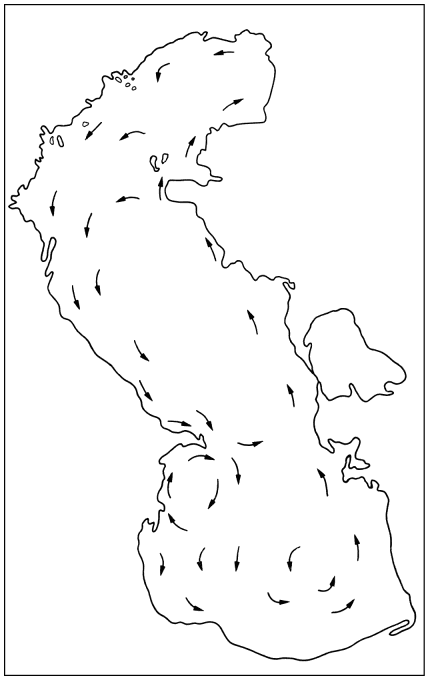 The waters of the Caspian Sea rotate counter-clockwise, forming a whirlpool in the form of an ellipse. And when the seasonal winds and flood river Volga unleash the whirlpool, the centrifugal force of the whirlpool increases, due to which, on the northern coast of the Caspian Sea, the water level rises to 1 meter. The average depth of the Caspian Sea is about 200 meters, on the northern coast about 5 meters, on the southern coast about 700 meters. Due to this, in the north of the Caspian the current speed rises from 1 to 10 km / h.
In the Caspian Sea, the peak seasonal increase in water levels is observed in June and August and coincides with the season of winds and the flood of the Volga River. During the drought over the Volga river basin, the level of the Caspian Sea does not increase. During the season of the western winds, the current velocity along the Murmansk coast of the Barents Sea rises to 5 km / h, due to which the seasonal rise in the water level reaches 0.5 meters. The maximum level values ​​are observed in October-November minimum in April-May. In the Bay of Bengal in the season of monsoon winds, the whirlpool speed rises to 10 km / h, due to which, the seasonal rise in water level reaches 1.2 meters. Seasonal changes in the level of the Sea of ​​Okhotsk are 0.2-0.5 m. The highest levels are observed in November-January, the smallest in March-April. Seasonal increase in the level of the Black Sea (up to 40 cm) is most pronounced in the southeastern part of the sea, where in summer the angular velocity of the currents reaches a maximum value. The assumption that the cause of seasonal water level rise may be atmospheric pressure, river runoff, temperature difference and water salinity does not stand up to criticism, these factors can increase the water level by several cm, but not more. Cyclones moving above the surface of the sea from west to east at a speed of up to 40 km / h can increase sea level for several days by untwisting the whirlpool. The presented theory can be easily verified by the connection between the velocity of currents and the sea level and the oceans. (Drawing on a map of depths and currents, seas and oceans).